The fifth ODI witnessed a different type of this form of dismissal, widely known in backyard cricket. Luke Jongwe was looking for quick runs in the 49th over, but Dawlat Zadran, who was generating impressive pace, went for the quick bouncer. Jongwe saw an opportunity and went deep in his crease to hook but did not see too much after that. Hurried by the shorter length, he took his eyes off the ball and completed his attempted hook. The pace took the ball flying over the fine leg boundary, but Jongwe went so deep in the crease that he was forced to step on the stumps. Jongwe became the first person to be dismissed hit wicket against Afghanistan. Gulbadin Naib chose a fuller length to Hamilton Masakadza early in his innings. In the 10th over, Masakadza creamed a drive into the ground to extra cover with such power in one swift motion, that the fielder claimed the catch. Bump ball. Masakadza's concentration broken, Naib went with a gentle outswinger again next ball, inviting the drive and it almost worked. Beaten. Naib persisted on that length with a similar delivery off the next ball, but Masakadza picked it early. Six over long-off. Batting at No. 4, Richmond Mutumbami displayed positive intent from the start of his innings. He used the sweep and lofted drives to garner boundaries, even as the Afghanistan bowlers started to re-find their lost lengths. Amir Hamza, bowling in the 30th over, tossed one up in Mutumbami's half and bore the brunt of a connected slog sweep. Not only was it well placed but it went so far that it cleared the sparsely-populated midwicket stand and left the ground. 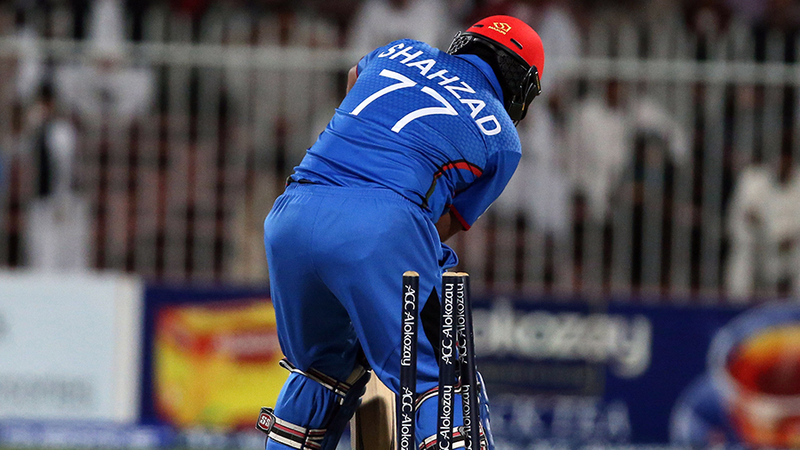 Despite creaming five boundaries in his 25, Mohammad Shahzad had not yet had enough. While watching his colleagues continue Afghanistan's chase of 249 in the taxing heat of Sharjah, Shahzad resorted to ice cream to cool himself down. He still was not done. A few deliveries later, cameras panned to Shahzad tucking into a second cup of ice cream. Gulbadin Naib was drafted into Afghanistan's ODI side after 11 months. He returned that trust with a sensational knock that lifted his side to a memorable series win. However, he showed his joy a tad too early. With three needed off four balls, Naib squirted a delivery to midwicket and raced back for the second, a run that he believed gave Afghanistan the victory. He removed his helmet, pumped his fists in celebration and ran the length of the straight boundary, completely unaware that he had only leveled the score. The remainder was just a formality though, as he thumped the following full toss to the roof of the stand at square leg to spark wild celebrations among his team-mates.